Review Summary: RASCALS is a madcap over the top zany entertainer aimed at the masses. RASCALS is a madcap over the top zany entertainer aimed at the masses. David Dhawan is still not tired of this formula – two guys gunning for the same girl (yaawn). Chetan (Sanjay Dutt) and Bhagat (Ajay Devgn) are two conmen who spend the entire length of the film trying to win the love of rich girl Khushi (Kangna Ranaut). And so when Dutt equates Kangna's shrill cries to a dog's yelp after someone steps on its tail, you simply nod in agreement. After months of prerelease hype and promotion, 'Rascals' has finally hit the screens while carrying with it good expectations. Well, as it turns out, even though the film isn't as mad as a 'Deewana Mastana' (the basic plot is similar - two guys trying to woo one girl and in the process outwit each other), it is still far-far better than 'Do Knot Disturb' or, for argument's sake, 'Hum Tum Shabana' that had recently released and was again based on a similar plot. Kangna, don't waste your time. 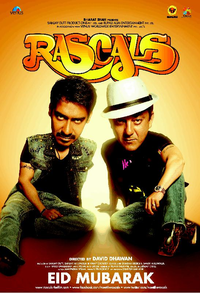 The gags in Rascals are so stale and tasteless and the situational comedy so devoid of any kind of originality or freshness, you wonder if David Dhawan just made this unfunny comedy to please his friends who play the major roles in the film. So while Sanjay Dutt Productions in conjunction with Rupali Aum Entertainment and Venus Worldwide Entertainment, may have had the right intentions, but the audience won’t be conned by Rascals. Rascals is not half as funny as is should've been. It will, therefore, fail to make its mark at the box-office and, in the process, entail losses to most of its distributors. Rascals will work only with those who love to wishfully forget their brains at home while going for a film. For those seeking substance in cinema Rascals will make you look like a rascal for having made the choice.